Global Spout & Non-Spout Liquid Pouch Packaging Market size was valued at over USD 6 billion in 2017 and is anticipated to witness CAGR at over 7.5% up to 2024. Strong outlook in food & beverages, personal care, home care, industrial and pharmaceutical applications will propel the spout & non-spout liquid pouch packaging market growth. Shifting consumer preference towards convenient packing options coupled with improving living standards are among key factors driving the product demand. Rising ready-to-eat food products demand due to busy schedules will support the industry size. Increasing consumer health consciousness resulting in shifting focus towards fluid diet & beverages will fuel business growth. For instance, as per Tetra Pak report, global 100% fruit juice market accounted for more than 15 billion litres in 2018. 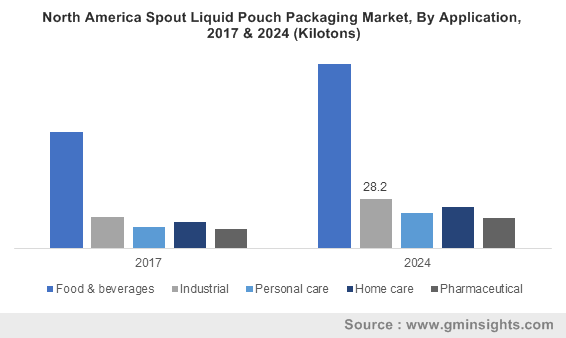 Shifting significance for decorative & stand up packages in retail industry will propel spout liquid pouch packaging market. Improved flexibility, easy to carry and light weight are the major properties stimulating the product penetration. Non-spout liquid pouch packaging exhibit less raw material usage & wastage in manufacturing and less space requirement in transportation resulting in low fuel consumption & pollutant emission. Surging polymer demand as raw material accompanied by its abundant availability will stimulate the industry share. Technological advancement and product innovations particularly for infant food with superior flexibility and puncture resistance properties has enhanced the product penetration. Advanced fitments such as re-sealable caps, tubes and pout valves provide convenience in food consumption. In addition, factors including ease of disposability, extensive shelf life along with cost effectiveness will support the non-spout liquid pouch packaging market size. Growth in R&D investments to innovate efficient designs & enhance utility among manufacturers will propel the product development. Fluctuating polymer costs due to volatile petrochemical prices is among key factor influencing the product price trend. However, stringent government regulations on polymer consumptions may hamper the industry growth. Spout liquid pouch packaging market will witness gains at over 8% in terms of revenue up to 2024. Development in pouring valves ensuring optimal hygiene, safety and waste reduction has stimulated the product penetration in recent years. Strong outlook from food & beverages and industrial applications due to ease in consumption and closure will provide lucrative opportunities for industry demand. Food & beverages accounted for more than 50% of the non-spout liquid pouch packaging market in 2017. Strong outlook in food applications including juices, dairy products, beverages, wine & spirits and water due to improved shelf life and protection against impurities will propel industry growth. Shifting consumer focus on hygiene maintenance coupled with rising consumption of ready-to-eat food will fuel the application scope. Personal care application in spout liquid pouch packaging market is anticipated to grow at over 7% from 2018 to 2024. Rising demand for anti-ageing skin cosmetics among adult & geriatric population is among key factors fostering industry growth. Moreover, upsurge in the novel in-store shopping experience demand particularly among women will further enhance the business expansion. Non-spout liquid pouch packaging market from 200ml sizes will value over USD 2.5 billion by 2024. Increasing consumer preference for small packages along with strategic packing quantity for FMCG are major factors positively influencing the segment demand. Surging millennial population coupled with rapid urbanization and busy schedules are among major factors driving product demand. 750ml size spout liquid pouch packaging market will witness CAGR at over 8% in terms of revenue up to 2024. Consumer inclination towards products offering value for money, adequate content and easy consumption will boost the business expansion. Advancement in material science along with emergence of multi-layer polymers has enhanced the product demand for larger quantities. Four-layer non-spout liquid pouch packaging market accounted for over USD 1.5 billion in 2017. Four-layer laminates provide superior versatility and offer substantial properties including excellent barrier, superior sealing to avoid leakages & machine losses, puncture resistance for safer shipments and economical usage. In addition, features such as microwave friendly for food items, high quality protective barrier against light & moisture, and convenience for frozen applications will propel industry demand. Three-layer spout liquid pouch packaging market is anticipated to register over 350 kilotons by 2024. Superior gas barrier, enhanced moisture proof & vapor isolation along with effective bacteria resistance properties will stimulate the business expansion. Moreover, improved transparency and glossy appearance provides positive outlook for product scope in consumer goods and pharmaceutical applications. Asia Pacific is anticipated to witness CAGR over 6% from 2018 to 2024. Rising flexible package demand from food & beverages industry in developing countries including China, India, Thailand and Indonesia will stimulate the product demand. Growth in household care industry due to changing lifestyles and increased hygiene awareness has enhanced the product demand. Europe spout & non-spout liquid pouch packaging market was valued over USD 2 billion in 2017. Changing demographic and income trends influencing shift in trend towards packaged food and cosmetic products will drive the regional demand. Presence of notable packaging manufacturers along with innovations to improve convenience are among major factors fuelling the industry growth. Global spout & non-spout liquid pouch packaging industry is highly fragmented owing to presence of large number of unorganized small scale as well as large scale manufacturers. 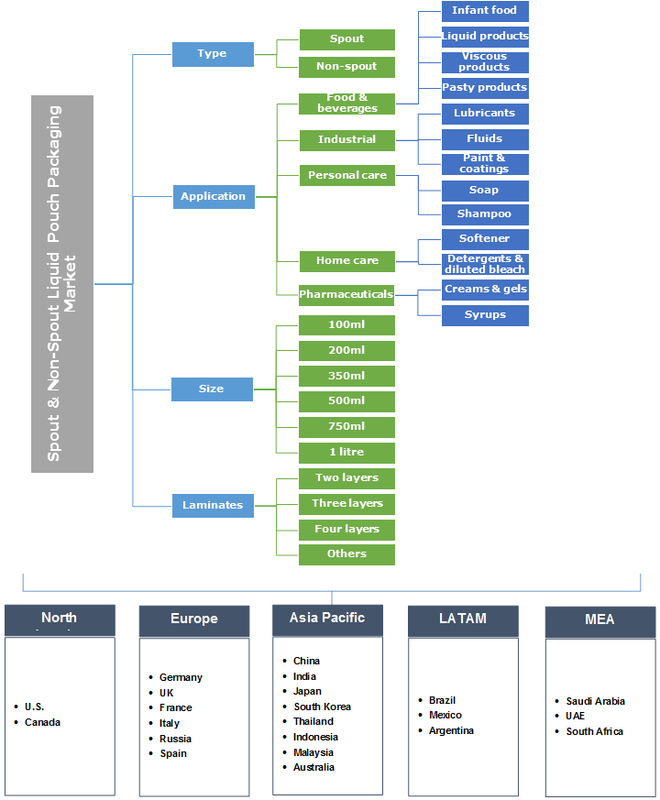 Companies with notable industry share include Sonoco, Ampac, Swiss Pac, Impak, Uflex, Tetra Pak International, Weyerhaeuser Company, and Smurfit Kappa. Other prominent players include Clondalkin Group, Billerudkorsnas AB, Cellpack, Huhtamaki Oyj, Dow Chemical and Constantia Flexibles. The manufacturers are involved in product innovations, mergers & acquisitions and plant expansions to gain competitive share. For instance, in October 2017, Tetra Pak International acquired Big Drum Engineering GmbH, a leading filling machines supplier for the industry. The acquisition will strengthen the company’s product offering for ice-cream manufacturers. The liquid pouch packaging industry has witnessed technological advancements to manufacture high quality packing products. Effective freshness preservation, protection against moisture and superior flexibility for fluid products has stimulated the industry share. Increasing number of research and development initiatives by several players will enhance product development. Presence of light aluminium & plastic layers providing longer preservation improves the product shelf life.